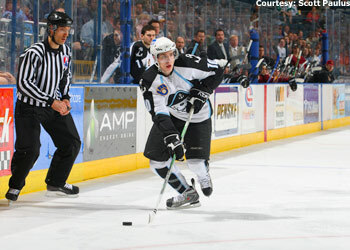 Mike Santorelli posted 21 goals and 21 assists for the Admirals last year. Playing with your brother at a high level of hockey is a chance that comes along once in a lifetime, if it all. Two years ago, Mark Santorelli had that chance in his hand and tossed it away. He was set to join his older brother, Mike, at Northern Michigan University, but at the last second veered off to play for Chilliwack of the WHL. "It would have been neat to play with him, but I never though it (the opportunity) would come again twice," Mark said. It very well could, courtesy of the Predators. Nashville drafted Mark, 20, in the fourth round of the 2007 Entry Draft, which puts him in position to play in Milwaukee. There, he could possibly skate on a line with Mike, 22, who as a rookie posted 21 goals and 21 assists for the Admirals last year. They've never played on the same team before, but it would seem a natural fit. Mark is a left wing, Mike is a center. "He's pretty smart on the ice. He passes, he makes good plays. I think we could both complement each other," is Mike's scouting report. "I think it would be kind of cool," Mark said. "I like to pass the puck and Mike likes to shoot. Mark produced the types of numbers with Chilliwack that suggest he could be as immediate a success as his brother was. Last year, he came up with 27 goals and 74 assists in 72 games. During the summer, working out with his brother in their hometown of Vancouver, Mark made sure to tap into his ready-made AHL resource. "He told me the biggest thing he found (as a rookie) was how much stronger guys are in the pros," Mark said. "You're not playing against boys anymore. That's one thing he made me get used to right away. This summer, I had to get a lot stronger. He's a very hard worker. I try to keep up with him." Mike's early review is that his younger brother was paying attention. "He realized it's a lot tougher," said Mike, a sixth-round pick by Nashville in 2004. "He's a pro now, you work out as a pro now. If he works hard, hopefully he gets rewarded." Regardless of the line combinations, the one obvious pairing will come off the ice. Mike and Mark, for so long separated during the hockey season, plan on being roommates. And acting like them too, instead of like former sibling rivals. "Ah, no, I've lived with him this long," Mike said of the possibility of getting on each other's nerves. "We get along really well, compared to most brothers," Mark said. "We don't fight too much. Sometimes we get sick of each other, but most of the time it's good." Pirates spreading out schedule -- Portland Pirates owner Brian Petrovek would like to see the AHL shorten its regular-season schedule from its current length of 80 games. He's on a league committee that's studying that issue. He doesn't know if, or when, action would be taken on that matter at the league-wide level. But he sure can take things into his own hands when it comes to the Pirates. Portland is playing what amounts to a 36-game home schedule at the Cumberland County Civic Center. Petrovek arranged that by spreading out four other "home" games – two in Lewiston, Maine, one in Orono, Maine, and one in Buffalo, N.Y. The scheduling serves to spread out the Pirates' brand of hockey. But it also slightly lightens the load of Portland games in that market. "We think its time has come. We like the direction this schedule has set us in," Petrovek said of a shorter season. "What we've been trying to do is soften the load on the greater Portland fan base. Forty games is too much product. In an effort to spread out our brand, it only makes sense to put our games in Orono and Lewiston." Those games aren't really eyebrow raising. The Pirates actually played one contest in Orono last year. The sojourn to Buffalo to host Albany on Feb. 10 is the interesting twist. Buffalo is the new parent club of the Pirates. Normally that's at least an eight-hour jaunt, but this trip is a little easier because Portland visits Hershey on Feb. 8. Portland will ease up to Buffalo a day ahead of time and let the players hang out with fans and team management. Petrovek initially was shooting for a visit to Buffalo in the 2009-10 season, but it came together this year instead. "It gives our guys a chance to play in the market they are dreaming of being in," Petrovek said. Anaheim beats Europe -- Veteran wing Joakim Lindstrom knew he had to get away from Columbus. He was prepared to travel to Europe to do so. Turns out, he only has to go as far as Anaheim. That's where the Blue Jackets agreed to trade him after Lindstrom, 24, perceived his career as stalling in Syracuse. Lindstrom played three full seasons with the Crunch, establishing himself as one of the AHL's best finishers with 65 goals and 94 assists in 176 career games. But those numbers translated to only 4 goals and 4 assists in 37 games with the Blue Jackets. In the offseason, Lindstrom, a native of Sweden, made it clear to the Blue Jackets that he was locked into going overseas if his only other option was returning to the Crunch. While Columbus could have said "Send us a postcard," it instead shipped his rights to the Ducks. Anaheim's offer of a one-year, two-way pact and a fresh start kept him in North America. "Anaheim called me, talked to me, gave me an offer, I changed my mind (about going)," Lindstrom said. "I felt like I needed a change." Lindstrom knows change can spin off in a number of directions. He's yet to show himself as any sort of consistent scorer at the NHL level, which could mean that Lindstrom's travels end in Iowa, Anaheim's AHL affiliate. "We'll see how things work out here," he said. "They have a pretty good team. There's not a whole lot of spots for players to take. But I'm in pretty good shape. I'm going to make it tough for them not to take me." If you'll be my bodyguard... -- Forward Devin DiDiomete is on the lookout for someone new to look out for. DiDiomete was the bodyguard on a line with Steven Stamkos in Sarnia last season. Stamkos had enough free ice to skate to the top of the 2008 draft. "I think if I wouldn't have been there, he still would have been all right," DiDiomete said. "It just took a little off his back knowing if anyone gave him any problems, I'd be there for him." The 6-foot, 200-pound DiDiomete may have played a small part in Stamkos' success, but it was a part nonetheless. Now, he's in camp with Columbus trying to earn an AHL deal to go to Syracuse, a pact that the Blue Jackets are expected to offer. An early key is that the agitator knows he has to change his role a bit to get a pro chance. It's an evolution that DiDiomete might be well equipped to make. Understandably hidden behind Stamkos' brilliance was a very productive offensive season for DiDiomete, a solid support player with 23 goals and 33 assists in 56 games, to go along with 216 PIM. "I think if I continue to do the little things, hopefully I can score some goals," DiDiomete said. "As soon as I found out I had a tryout here, I worked hard in the gym all summer. Hopefully Columbus sees I'm ready for the AHL and gives me a contract." DiDiomete is going to extra lengths to show his resolve. On his first shift in the first game of the Traverse City, Mich., prospects tournament, DiDiomete crashed into the boards and separated his left shoulder. But it's hard to cast a shadow from the training room, so DiDiomete has kept playing. "It's more just sticking up for your teammates," DiDiomete said of making sure he fills his role. When (opponents) start taking advantage of other players, you definitely try to step in."